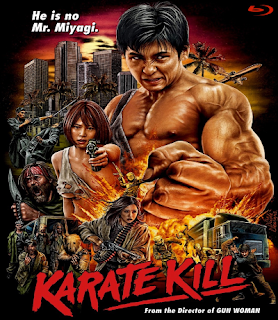 Tarantino meets Cannon Films in Karate Kill, from acclaimed filmmaker Kurando Mitsutake, on Blu-ray, DVD and VOD July 18. Featuring a "grimly relentless performance” (Japan Times) from Hayate, with solid support from Iron Fist’s David Sakurai and WWE icon Katarina Leigh Waters, Karate Kill will be available on Blu-ray and DVD - exclusive to Target, Walmart, Best Buy and Amazon – on July 18. VOD will be day and date on iTunes, VHX, Google Play, Fandango, Vudu, Dish, Vubiquity, Comcast, Charter, Cox and Xbox. A “must see” (Terror Weekend) action masterpiece from the director of Gun Woman and Blind Wolf comes to the U.S. When Karate master Kenji’s (Hayate) young sister (Mana Sakura) is kidnapped by a dangerous cult, and taken to the U.S. he will stop at nothing to find her. Partnered with a mysterious shot-gun toting partner, Kenji must use his mastery of Karate to dismantle the cult members one by one in spectacular and bloody fashion, until he finds his sister. Dark Cuts releases Karate Kill July 18.